November 17, 2009 June 10, 2014 Warners' Stellian ApplianceLeave a Comment on Want Dollars for Dishwashers? Though it lacks a pithy catchall like Cash for Clunkers, the Energy Efficient Appliance Rebate Program — or Cash for Appliances as I like to call it — is close to being approved for the state of Minnesota. Qualifying appliances mean Energy Star-rated models of refrigerators, freezers, clothes washers and dishwashers. So waiting until March to replace your stove, microwave or dryer is NOT smart. Though, neither is waiting in general. Consider this: A refrigerator, washer and dishwasher bought in the 1990s cost an average $207 more per year in utility costs than current, energy-efficient models. 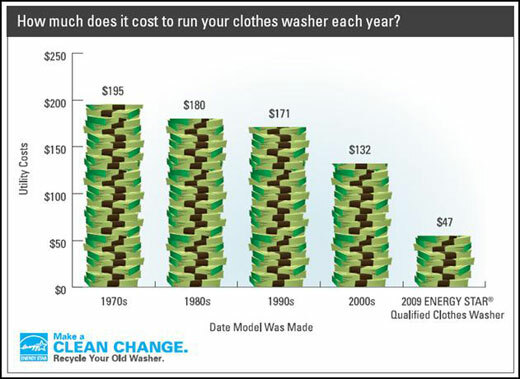 A washer purchased in this decade still costs an average of nearly 3x more to run than a 2009 Energy Star model. So in the months waiting, you’re actually spending more money, not saving it. Brands like Frigidaire are offering up to $150 in Energy Star rebates, which end in November. And many utility companies already offer incentives to replace your appliances with Energy Star models. For example, Shakopee Public Utilities offers $60 to replace a dishwasher and $65 for refrigerators, freezers and washers. $150 + $60 + ($65 x 3) = $405 in rebates. See DSIRE (Database of State Incentives for Renewables and Efficiency) for a full list of residential incentives. The state was granted about $5 million from the federal government for the program, and about $400,000 of that will be used towards administration, such as rebate processing. So only an estimated 25,000 rebates will be available. Warners’ Stellian and other retailers were asked to commit our own in-kind funds for serivices like consumer education, which is exactly what you see going on here. If you’d like to receive news alerts related to the Cash for Appliances program, e-mail stimulus@warnersstellian.com with the subject SUBSCRIBE.